The convention, who this year’s theme is "Role of Indian Diaspora in Building New India", began on Monday morning. New Delhi: Prime Minister Narendra Modi will on Tuesday formally inaugurate the 15th Pravasi Bharatiya Divas convention in his parliamentary constituency of Varanasi. The convention, whose this year’s theme is “Role of Indian Diaspora in Building New India”, began on Monday morning. Prime Minister of Mauritius Pravind Jugnauth will be the chief guest of the convention, while Himanshu Gulati, member of Parliament of Norway, will be the special guest. Kanwaljit Singh Bakshi, member of Parliament of New Zealand, will be the guest of honour. The decision to celebrate Pravasi Bharatiya Divas was taken by then prime minister Atal Bihari Vajpayee and the first event was celebrated on January 9, 2003 here. January 9 was chosen as the day to celebrate Pravasi Bharatiya Diwas as it was on this day in 1915 that Mahatma Gandhi had returned to India from South Africa. 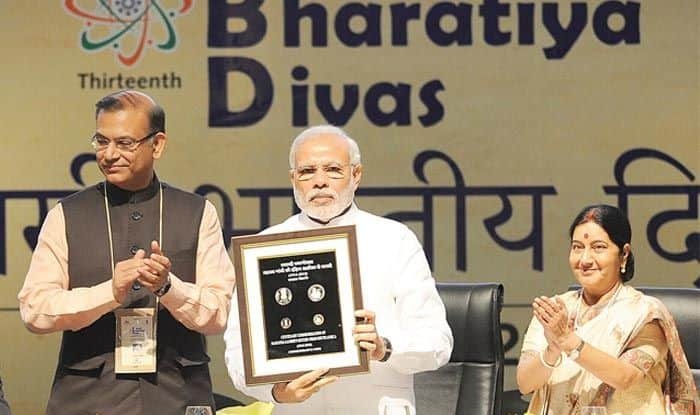 During the convention, Pravasi Bharatiya Samman is conferred on the selected overseas Indians for their significant contributions to various fields, both in India and abroad. On Day 1 on Monday, External Affairs Minister Sushma Swaraj, addressing NRIs, invited them for investment in the field of education. She said, nowadays, India offers limitless opportunity for those who want to work here. Swaraj said India can be hub a for higher education including research and development. She said, India will be source of skilled manpower to the world by 2022. Minister of State for Sports and Youth Affairs, Colonel Rajyawardhan Singh Rathore said, NRIs have made an identity for themselves in the world. He said, no matter how long one stayed outside, India is in everyone’s hearts. Sushma Swaraj said India can be hub a for higher education including research and development.